14 January 2005. The Huygens probe is woken from a 3-week slumber by its internal clock, just 4 hours before arriving at Titan. 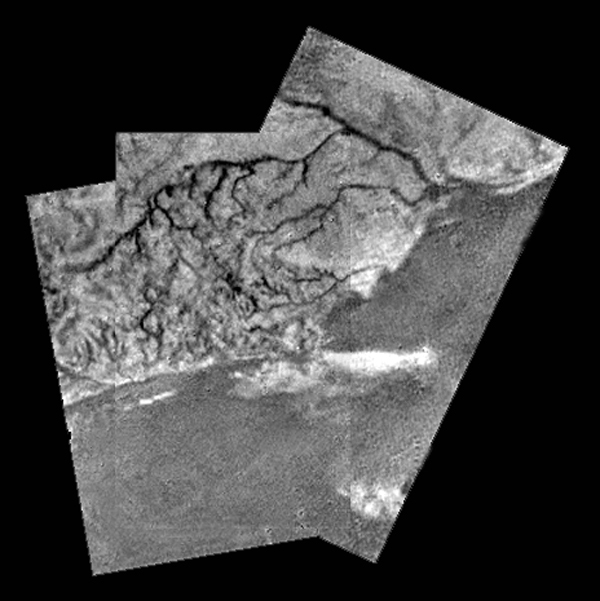 A view of Huygens’ probable landing site based on initial, best-guess estimates. The descent lasted 2 hours and 32 minutes. The signal from the probe was lost 72 minutes after landing, as Cassini passed over Titan’s horizon. Huygens is thought to have continued functioning for more than 5 hours, but only analysis of data picked up by European radiotelescopes will tell for sure. The Huygens mission was hailed unanimously by the press and scientists as a resounding success. 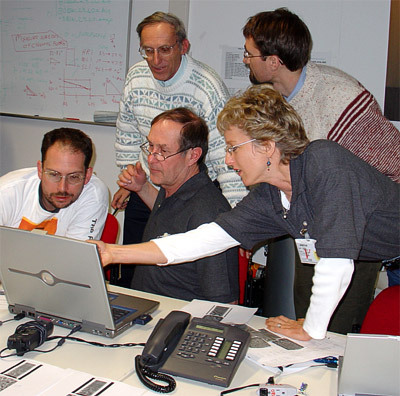 But it was not without a few tense moments, as the teams at the ESOC* control centre in Darmstadt, Germany, can testify. The 1st data coming in at ESOC on 14 January indicated a stark “receiver OFF” message; 2 words that scrolled across the control screens for 7 long minutes. It would emerge later that this data acquisition glitch occurred because the telecommand activating the receiver channels on the Cassini orbiter had not been sent in full. Only the B channel received data from Huygens, albeit with excellent results, since no data were dropped. It would appear that the malfunction on the A channel only affected the number of images collected (350 instead of 700) and certain sensors. But the quality of measurements acquired by radiotelescopes, exceeding all expectations, could fill this gap in the data. Just 20 W, fainter than a domestic light bulb: that’s how weak the signal beamed by Huygens to Cassini was. Some 18 radiotelescopes on Earth pointed their antennas toward Saturn with a slim chance of picking up this signal. Indeed, scientists did not envisage using radiotelescopes until 1 year before Huygens’ arrival, when they realized it would be theoretically possible to detect the probe, thus providing a status check a full 3 hours before Cassini started sending data back to Earth. A plus for science teams, even though a failure to detect a signal—while it would certainly have upped the tension in the control centre—would not mean the mission itself had failed. Initial analysis of Titan’s surface has unveiled a landscape of varied relief and channels that show something is flowing there. Lighter, raised areas seem to be composed of water ice, while darker areas are thought to result from the accumulation of hydrocarbon dust deposited by these flows. Another hypothesis still to be confirmed is the presence of methane rain. Readings from the HASI** instrument, which recorded a ground temperature of –180°C and pressure of 1.5 bars, confirm current thermodynamic models and would appear to support this conclusion. The GCMS** instrument also sensed a burst of methane gas boiled off from the surface as heat generated by the probe warmed the soil beneath it. This suggests Titan’s subsurface is soaked in liquid methane. Other instrument data from Huygens still being analysed have not yet given up their secrets. At this early stage in the mission, initial hypotheses like the presence of methane rain should be viewed with caution. But science teams are already piecing together a tantalizing picture of a methane cycle on Titan to compare with the water cycle on Earth.